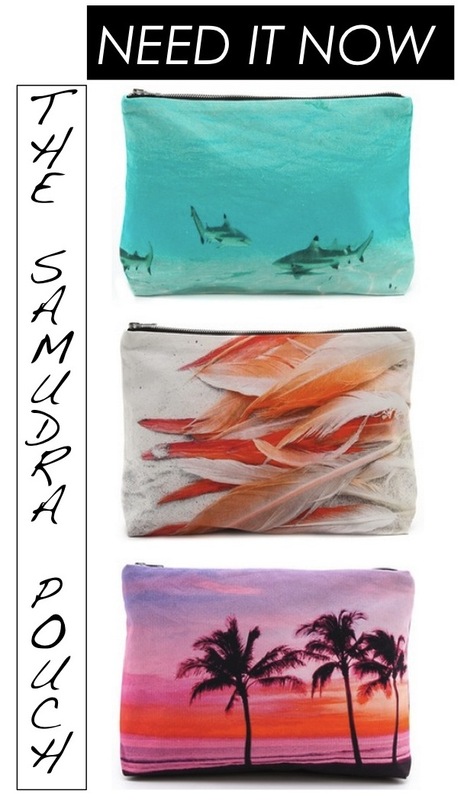 Need, want, have to have... that's pretty much how I felt as soon as I saw these Samudra pouches. Then I procrastinated and they sold out. Now that they're back online I'm snagging one of these beauties as soon as I can decide which to get! Eek! I'm totally afraid of sharks (aren't we all?) but that first pouch is too cool. Omgsh, I love these!! They are so fun and unique!! I vote for the feathers! SHARKS for sure, that color is everything and so perfect for the upcoming season! p.s. Vote for me....details on the blog! These pouches are so pretty. I would love to have all of them but I think my favorite is the palm trees. I love the shark one!! Which doesn't make sense, because I'm absolutely terrified of sharks. I think it's the fact that I'm really loving blues lately! Thanks for the well wishes in regards to the contest! You are so great! Okay, I can totally see why you're obsessed. I can't decide between the feathers and the palm trees.